At HEH, we have the safest, most natural-looking hair extensions system available for your natural hair. 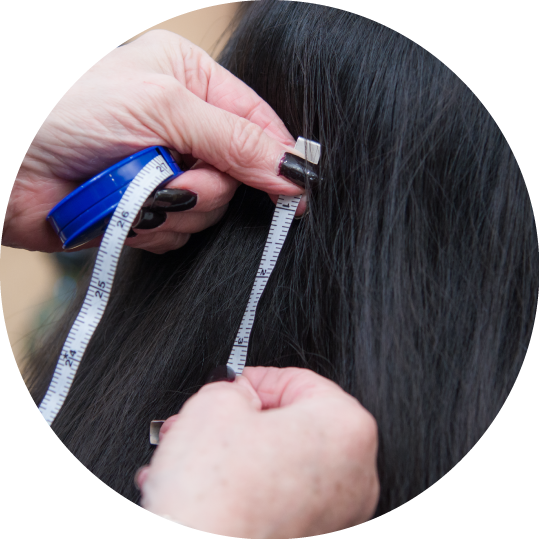 We do not use glue, keratin, sewing, braiding or taping methods. The introduction of the system called Eurolocs came from Europe and Canada over 30 years ago. In the USA, it was known as the Hairlocs System. Today, it’s just called the Loc System. Brenda holds certification in both systems, plus others to broaden her knowledge in the field of extensions. The question we often receive is why we don’t do other systems. Our answer is, unless a system is non-damaging to the natural hair like the method we use, we will not do it. The original hair-loc system that we employ uses a completely non-damaging hair extensions application method. A little copper tube is attached to your natural hair, and the hair extension is then pulled through the copper tube. It is then crimped flat making it very comfortable to wear. We use premium Russian hair extensions available in the industry. Not all extension stylists are properly trained. Technique is key to a beautiful non-damaging installation! We do not discuss prices over the phone. A free consultation is required with Brenda. The price for our extensions really depends on the desires of the client. During our free consultation, Brenda and the client will meet and discuss what is best for the client to achieve the desired results she’s looking for. Brenda will then match both color and texture for seamless beautiful hair. Only those you want to know, will know you’re wearing extensions. If you’re in search of natural-looking hair extensions in the Houston area, contact us!